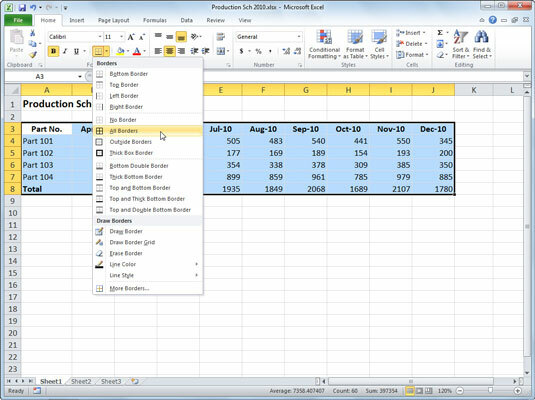 In Excel 2010, you can add borders to individual cells to emphasize or define sections of a worksheet or table. Use the Borders button in the Font group on the Home tab to add borders of varying styles and colors to any or all sides of the cell selection. Don’t confuse the borders that you add to accent a particular cell selection with the gridlines normally used to define cell borders in the worksheet — borders that you add are printed whether or not you print the worksheet gridlines. You can remove the display of gridlines by clearing the View check box in the Gridlines section of the Page Layout tab. Click the down arrow beside the Borders button in the Font group on the Home tab. A drop-down menu appears, with all the border options you can apply to the cell selection. Use the Borders button on the Home tab to choose borders for the selected cells. Click the type of line you want to apply to the selected cells. To have Excel draw borders only around the outside edges of the entire cell selection (in other words, following the path of the expanded cell cursor), click the Outside Borders or the Thick Box Border option. If you want borderlines to appear around all four edges of each cell you’ve selected, select the All Borders option. 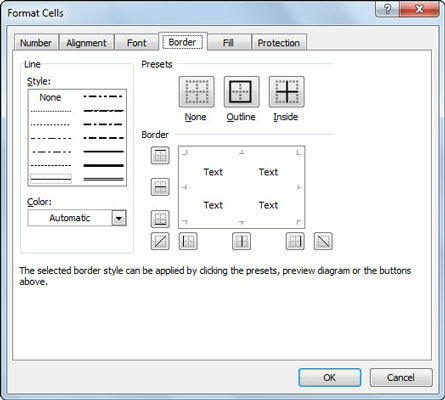 You’ll find more options for cell borders on the Border tab of the Format Cells dialog box. To remove borders in a worksheet, select the cell or cells that presently contain them and then click the No Border option in the Borders button’s drop-down menu.